We’d love your help. Let us know what’s wrong with this preview of Love at First Laugh by Krista Phillips. He likes streamline. She prefers embellishments. His forte is business. Dive into eight brand new contemporary Christian romantic comedies from some of your favorite inspirational authors. A tiny, chatty fairy artist with multicolored pastel hair. A burly, bearded landscaper who can't get a word in edgewise. They have nothing in common, but is that enough to keep them apart? She's tired of waiting for happily-ever-after, so she takes matters into her own hands...with online dating. He has the worst bad-date streak ever. How will God show two people who are determined to do things their own way that He's had a perfect plan all along? She's a dog walker who agrees to a full-time position caring for a puppy. In total shock, she's handed a precious baby girl. He's a construction mogul who's taken his infant niece into temporary relative placement -- keyword: temporary. Unless the sassy southern nanny can change his mind...and his heart. When two childhood sweethearts find themselves thrown together on the road to a trade show that could save her career, past mistakes threaten to ruin her chances--and the possibility of rekindling a romance. Will the end of the summer find them apart once again? To ask other readers questions about Love at First Laugh, please sign up. 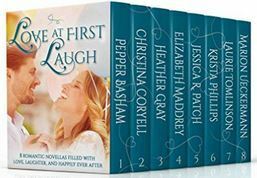 Love at First Laugh was one of the best novella collections I've read. I discovered quite a few new-to-me authors that I'm adding to my 'must buy' list. Filled with lots of laughs, faith, and heartwarming moments, I would recommend this to any lover of contemporary romance. Every year Nora dreads her birthday because of her mother's over the top matchmaking attempts. But to her surprise and delight, her gift this year is a trip to the Jane Austen Festival in Bat Love at First Laugh was one of the best novella collections I've read. I discovered quite a few new-to-me authors that I'm adding to my 'must buy' list. Filled with lots of laughs, faith, and heartwarming moments, I would recommend this to any lover of contemporary romance. Every year Nora dreads her birthday because of her mother's over the top matchmaking attempts. But to her surprise and delight, her gift this year is a trip to the Jane Austen Festival in Bath, England. Upon arrival, her excitement turns sour when she meets rude Ethan Keller. Ethan's had enough of his uncle's matchmaking attempts and his latest one is a doozy! To say Nora and Ethan start off on the wrong note would be quite a bit of an understatement. Second Impressions was such a charming novella and a great way to start off this collection. I loved every second of it and couldn't read it fast enough. There were quite a few funny moments that had me literally laughing out loud and left a lingering smile on my face. (The homicidal bonnet is just one example of many, lol.) This was the first time I've read anything by Pepper Basham, but I'm definitely going to check out her other books now. Willow is a quirky, rainbow-haired, super chatty fairy artist. While Clint is a bearded, no nonsense, quiet landscaper. After their first meeting, where he nearly mows her down, can these two complete opposites find love? This was a different story than the norm and Clint and Willow are not the typical romantic leads, which I found very refreshing and I completely loved. Willow's such a fun character and Clint is quite dreamy. (I might have a wee bit of crush on him.) This was a really great story and the first I've read by Christina Coryell. After totally adoring this novella, I'm definitely going to be checking out her other books. Best friends Lia and Maverick decide to try out online dating after she suggests it and he dares them to see who has the absolute worst date. And let me say, they both had quite a few absolutely terrible ones! The friendship between Maverick and Lia was really sweet. They're perfect for each other, if only they realized that! There's also a little mystery going on with the ER's network servers that was quite intriguing. Lia deals with some very real body issues that were easy to relate to. I thought author Heather Gray handled this very well. Heather Gray has become one of my favorite authors and I'm looking forward to whatever she writes next. Deidre's looking for a new start and hopes she's found it when she purchases the old home, Peacock Hill, with the intent to fix it up. Jeremiah's loved the glorious mansion, Peacock Hill, for as long as he can remember. So when an out of town renovator buys the property, he offers to lend his handyman skills to the project if need be. They hit it off, but then, her ex shows up and things get complicated. The renovation aspect of this book was great. I like watching house remodeling shows, so when that's featured in a book, I get really excited. There were, also, some hilarious moments involving texting and auto correct that really had me laughing. A Heart Restored was another great read from Elizabeth Maddrey. When busy businessman Griffin is granted temporary custody of his niece, he needs help caring for her and he needs help fast. Emma Kate's a dog lover who works at a dog boutique and walks dogs to make a living. She's stunned to find out that the new dog she's supposed to take care of is not actually a dog, but a nine month old baby girl. Oh my goodness!... I absolutely adored this novella! I'm a huge dog lover, so I love it when I find books featuring dogs and fellow dog lovers. Emma Kate is a genuine, funny, and caring person. Griffin's married to his work and tries his hardest to please his father. I didn't know how I'd feel about Griff since he's not a fan of dogs, but he's a great guy who I couldn't help but fall for. And I can't forget to mention sweet little baby Cora and Emma Kate's hilarious Grandma Honey. Unleashing Love was a heartwarming tale filled with lots of heart and tons of laughs. Mari is a nanny to adorable four year old twin girls and is a woman who thrives on schedules and has a ten year plan she intends on sticking to no matter what. When the twins spontaneous Uncle Brandon shows up, Mari's carefully scheduled life gets turned upside down. Brandon and Mari's first meeting was hilarious. They are polar opposites, but that's what makes things interesting. A (nearly) Normal Nanny was a sweet novella and the first I've read by Krista Phillips. Childhood sweethearts Nick and Chelsea meet again after twelve years apart. He volunteers to accompany her on a roadtrip to Chicago for a conference that will hopefully save her planning and stationary business. Will their love bloom again or will they go their separate ways once more? With the opening scene taking place at a charity baseball game, I was hooked. Nick was an all around great guy that I instantly liked. Chelsea's job was unique. I've never read about anyone in the stationary or planning business, so that was new and interesting. She had quite a few mishaps along the road trip and then at the conference, but that just made her so much more relatable and likable. I really enjoyed this novella and am excited to see what Tomlinson comes up with next. After the recent inheritance of a beach house and a lung disease diagnosis, Elizabeth and Brian decide that God is telling them it's time to retire. When they receive some unexpected news, will it be the blessing they've always longed for or a curse? A Time to Laugh was a very inspiring read and really hits home the fact that anything is possible with God. Brian and Elizabeth's unshakable faith was so wonderful to read about. This was the first time I've read anything from Ueckermann, but I have some of her other books on my TBR list that I'm definitely going to be reading very soon! This was one set of novella that I thoroughly enjoyed. Some of the authors I'd never read, but Jessica Patch, Christina Coryell, and Pepper Basham were in fine form! I enjoyed those three the best. The ones by Heather Gray, Krista Phillips and Laurie Tomlinson were good, too. The last one, A Time to Laugh, I did not care for. In this one, the 60 year old female character discovers she is pregnant. The title of this contribution does not mean the story has any laugh line. It does not. Perhaps it' This was one set of novella that I thoroughly enjoyed. Some of the authors I'd never read, but Jessica Patch, Christina Coryell, and Pepper Basham were in fine form! I enjoyed those three the best. The ones by Heather Gray, Krista Phillips and Laurie Tomlinson were good, too. The last one, A Time to Laugh, I did not care for. In this one, the 60 year old female character discovers she is pregnant. The title of this contribution does not mean the story has any laugh line. It does not. Perhaps it's because I am the same age as the woman in the story and cannot conceive (no pun intended) of being pregnant at my age. It just didn't seem realistic at all to me. The stories had meaning, were written well and very, very enjoyable. Patch and Coryell both has this amazingly dry sense of humor that will cause the reader to laugh out loud at times. Both of these stories, as well as Basham's seemed like full length novels to me. Very well done, ladies. I would not hesitate to recommend this set to anyone. Such a great combination of fun-filled stories, humor, and romance. WOW! What a fun collection of novellas and a dream collection of authors! I have read four of the eight novellas and enjoyed each one. I even found myself laughing out loud a few times - love doesn't have to be all drama! Pepper Basham's Second Impressions is delightful. It takes place at the Jane Austen Festival in Bath, England. You don't have to be a Jane Austen fan to take this trip with Ethan and Nora. And the final "get together" - oh, my heart!! Jessica Patch's Unleashing Love is "laugh out WOW! What a fun collection of novellas and a dream collection of authors! I have read four of the eight novellas and enjoyed each one. I even found myself laughing out loud a few times - love doesn't have to be all drama! Jessica Patch's Unleashing Love is "laugh out loud' funny and "butterflies-in-the-stomach" romantic at the same time. Jessica has such a way with words and she can write a hero!!! You will love Griff and Emma Kate! Laurie Tomlinson's That's When I Knew is the story of childhood sweethearts coming back together after 12 years. I enjoy a good "why have we wasted all this time" story and this one was no exception. Nick and Chelsea also get into some interesting predicaments. This was my introduction to Laurie Tomlinson and I will definitely be reading more. Great reads in this collection! This collection of stories will have you laughing, crying and cheering for the couples as they try to find happiness. Each author brings their own unique writing style and gives readers hours of delightful stories . I don't have a favorite because I thought every story was beautifully written. Don't miss your chance to get your copy to enjoy. What a delightful story this is. The details are so picturesque and helps readers visualize the setting. I absolutely ad This collection of stories will have you laughing, crying and cheering for the couples as they try to find happiness. Each author brings their own unique writing style and gives readers hours of delightful stories . I don't have a favorite because I thought every story was beautifully written. Don't miss your chance to get your copy to enjoy. What a delightful story this is. The details are so picturesque and helps readers visualize the setting. I absolutely adore Nora. She is very smart and a huge Jane Austen fan. Her family is always trying to play matchmaker and leads to some funny encounters for her. As her birthday arrives, she knows what is about to happen. A grand party with lots of food and perhaps a romantic meeting is in store for her. She is quite surprised by the gift she gets this year. Her dream vacation to Bath, England to attend the Jane Austen festival is coming true. There are many surprises awaiting her and a chance meeting with Ethan. What a dashing character he is. They have some tense moments but oh my are they funny . Will Nora finally meet the man of her dreams? Is Ethan trustworthy? Don't miss this wonderful story of chance meetings and characters that jump off the pages. This story was a bit different for me. I loved Willow and her free spirit as I call it. She has a great job drawing fairies and seems to have fans who love her characters. She sure can be crazy at times and when she runs into Clint I almost fell out of my chair laughing. He is mowing the lawn and suddenly some crazy little thing comes running outside to stop him. She thinks Clint is a hillbilly with his long beard. So what does Clint think of her rainbow hair? Will these two ever become friends? It's a battle of the lawnmower vs rainbow in a cute story that I loved reading. Lia and Maverick are great friends . They enjoy each other's company and have a blast telling each other about their disastrous dates. A dare has placed them in the online dating scene. Their dates are funny and horrible at the same time. Have you ever done online dating ? It's like rolling a dice. You never know what you are going to get. I'm not sure who has the worse dates but Lia and Maverick can't wait to share with each other. What happens when they both decide to try a new dating site? They discover that it is a Christian dating site so hopefully they will not have to deal with people who are less than truthful. Maverick is such a great character. He is funny, smart and loves God. I loved the true friendship Lia and Maverick have and loved their interaction. They are so comfortable with each other. The story has a bit of mystery which really intrigued me. I found myself telling Lia that the man of her dreams is right in front of her. Do you think she heard me? Will Lia and Maverick find their soul mates? The author gives readers characters with great morals and I loved how they always turned to God for His direction. I love watching shows about renovations and seeing all the beautiful designs . The author does a great job of making readers front row seats to a couple who does remodeling. It was fun to read about Deidre and her big undertaking of a beautiful and historic home. I loved her determination and ideas. She is struggling with her relationship with God and trying to trust again. When she meets Jeremiah her guard is up. Jeremiah is a great person and wants to help Deidre on her project. The story is written well and I loved how Jeremiah shared his faith with Deidre. Will Deidre learn to trust again? It's a great story about finding your way back to God and mending your heart. I loved how the story really shows how people struggle with hurt and find a way to overcome it. The opening of this story is so funny and with the authors great words I saw the scene as if I was right there. Emma Kate is a hoot and I love her sassy attitude. She is petite and is walking a dog that could be mistaken for a pony. She has been wanting to meet the well dressed man she sees most days on her walk. Griff is none to happy when he is run over by this huge dog. The interaction between him and Emma Kate are priceless. I wonder if Griff is upset or embarrassed by the incident? Guess sometimes first impressions are not always good . Things just seem to go from bad to worse for Griff. After getting bad news he is now trying to decide what to do about his niece. The baby is only nine months old and after calling his dad, it is clear that the baby is not something his dad wants to deal with. I found Griff's father to be cold and distant. What would make him feel nothing for his family? After a big misunderstanding Emma Kate finds herself in a sticky situation. Will she help Griff out? The story is funny and at times emotional. I loved that they were both looking for acceptance and willing to take a chance on each other. The story made me cry at times. It is hard to not feel wanted by your family . Can Griff forgive and let someone very special into his life? You don't want to miss this story about a man who hates dogs, a woman who loves dogs and a baby that needs love. The sparks are sure to fly when Mari the nanny is suddenly surprised by an intruder in the home she stays at. She must keep the children safe so she does the only thing she can think of. There is just one little problem after she knocks the intruder in the head. Did someone forget to mention that the children's uncle was back in town? Brandon has come back to his sisters place to stay after a concert tour has been cancelled. Brandon is fun and likes to take chances. Mari is serious about her duties as a nanny and it's a perfect setup for lots of laughs as two people try to make the best of an uncomfortable setting. Will Mari lighten up and get some fun back into her life? Can Brandon show Mari that it's ok to trust others and to let go? I thought this was a perfect story that shows opposites attract. I loved the story of Chelsea and Nick. Chelsea has a big heart and loves sports which is a big plus for guys. Nick is excited to see Chelsea after such a long time. They shared a lot of great memories. Will there be a reconnection between them? Chelsea finds delight in the small things that Nick remembers. I loved the scene when they were eating ice cream. It just seemed so relaxed and brought a smile to Chelsea's face. I found Nick's truck to be a great part of the story. Sometimes it is hard to let go of something you hold dear, but that truck may cause some funny moments as it sputters down the road. The best part of the story is reading that they each listened to God and let their relationship grow with His guidance. What a wonderful story this was. Elizabeth and Brian have always longed for a child but it never happened. They have done some rewarding mission work over the years and have decided to settle down and enjoy life . Both of them are in their sixties and ready for a new chapter in their life. God always has the best timing and what a surprise He has for them. When Elizabeth and Brian get the news that they are expecting , I could just imagine the look of their faces. I could relate to this couple so much. I remember when I found out I was pregnant after having two teenage boys . I cried and thought that God had a good sense of humor. Much like Elizabeth I embraced my pregnancy and had my share of looks and whispers. I loved how they were so in awe of the miracle God had given them. There is much emotions in this story and I loved how the author allowed the pregnancy to draw someone to a relationship with God. Miracles do happen and God has a plan for our lives. We are never to old to be blessed by Him. This is a heart-warming and enjoyable story by a new-to-me author. I look forward to reading more of Jessica Patch’s books. This is the first story I have read by Laurie Tomlinson, and I really enjoyed it. I look forward to reading more of hers. A Time to Laugh is an absolutely ADORABLE story that kept me laughing!! Marion Ueckermann does such a wonderful job of capturing the humor and surprises of Elizabeth's unplanned pregnancy, along with the concerns and fears that older women and high-risk pregnancies have to face. But it is also a story of learning to trust a faithful & loving God, and willingly bowing to His sovereignty. LOVED this story!! My favorite thing about Chelsea's character was that she wasn't your typical lead woman. She was head strong, opinionated, loved sports, was competitive, and didn't seem afraid to get dirty. It's not too often you see a woman like this in a romantic story, even though I think a lot of them should be this way! I am after all, and shouldn't all characters be like me? Just kidding.... But I do think that characters should be more realistic and let's face it, there are a billion different types of women out there. This type just happened to strike a chord with me. That being said, Chelsea also had this vulnerable side that didn't come out often, but when it did it added depth to her character and the plot line. Chelsea and Nick slipped easily into conversation when they were stuck together - a clear sign to me that they should be together! I loved the interaction between them. It wasn't forced, or awkward (most of the time), it was just real. They were goofy, fun and serious. It was a cute story and I loved reading it. Have you ever read a scene that you could see vividly in your mind that made you burst out laughing? That's exactly what happened in the very first scene of this novella! Then in the next section I was doing the exact opposite, tearing up and having some sad emotions. I enjoy reading a story that is filled with different kinds of emotion. It keeps you on your toes and has you looking for what is coming next. This was such an entertaining story to read. I absolutely loved the nickname Mr. Money, and snickered to myself when reading it. Deep down I feel he was really more than that, although it didn't always seem like it. It's funny how we as a society stereotype people based on the way they are dressed and carry themselves. Then sometimes you get a sweet surprise, much like Mr. Money, to find out they are someone entirely different. He had great personal growth in trying to take care of his niece, and had me rooting for him before it was all over. I always love to discover a new author, and what a delight to receive a copy of this novella. Just the right length for a short story, evenly paced, unhurried and very satisfying read. The story begins with Chelsea Scott, Stationery & Planner entrepreneur sliding onto a Softball base, to look up and discover childhood friend, Nick Pearson. Her 'first-love and first-heartbreak' she hasn't seen him in 12 years. A little unnerved by his reappearance he quickly weaves his way into her trip to Chicago, for the International Stationery Show. She's hoping for a large contract to give her company the boost it needs after being swindled by the last man she gave her heart to. Key-note speech at the Convention, and the heavy responsibility she feels for her team, Chelsea is heavily under pressure. Nick is cool, calm and collected and is determined to give this opportunity to travel with her his best shot at the second chance he never thought he'd get. Chelsea seems to encounter one bump in the road after another with the peak when she comes face to face with the one person who almost destroyed her business. Will she take the risk with her heart & her company? What a fun love story. I know this is a novella so it's supposed to be short however it left me wanting so much more at the end of this story I felt like there was or is more to come of the story. The story is a good clean romance with twist and turns through out and even ones you don't expect. This love story was a fun read. Each one of the characters jobs through twist and turns in the story and added a little mystery to the story. While I did fine that the story was some what predictable I loved Watt's and would love to read her story. I also loved the fun friendship between Watt, Lia, Maverick and Watt's team mates it made you want to join in on the fun. This story wasn't all the way there for me. Without giving anything away, the way the story end had me "Like really thats it" um ok. It just seem to have ended abrupt and also seemed like there should have been a little more. The storyline was about following your dreams and allowing forgiveness in yourself and with God. I flew through this book it was a total page turner. It was summed up perfectly and was a super fun read. I dealt with what love is really about, finding your dreams and forgiveness and cute dogs. I loved how the author let everyones personality shine through the pages weather they had a big part in the story or not. I felt like I was catching up with friends not reading a book. What happens when you take a Nanny, twins and a musician? Well this book happens and you are going to have some guaranteed laughs and so much fun. So far in this series this is the only book that doesn't have a child involve in the storyline. However its still a super fun read, with some twist and turns thrown in for good measure. The author did an amazing job at having the book seem longer then it really was but keeping the story flowing so that you are turning the pages to see whats going to happen next. SUPER Fun read for sure. This story seems to sum up the whole series of books. Gods love is there and no matter what and he does have a sense of humor. This book really packed a punch and has a way of getting you sucked in from the beginning to the end. Such a wonderful story and such a neat way to sum up love for each other and God's Love. This is Jane Austen meets rom-com in a modern world. With all the wit and heart of an Austen story, Nora and Ethan are thrown together with a little bit of matchmaking and a lot of personality. One thing I love about Pepper’s stories is that her characters have a deep sense of normalcy. It shines through in the little habits and comments, like the simplicity of a dream or talking over tea with hand gestures and a butter knife. This authenticity makes them all the more relatable and down-to-earth as you journey with them through a story. The references and clever parallels to Austen characters will bring a smile to any Austenite’s face. The humor and comedic situations had me giggling more than once — especially where Ethan and Regency attire was concerned. Beneath the lighter side of the characters, though, is a story of heart. Of realizing dreams might just be in reach, of having the faith to believe in them. Nora and Ethan will work their way into your heart in this little novella. If you’ve never read a Pepper Basham novel (why not!? ), this is a perfect place to start to glimpse her style and storytelling. And, if you love all things Austen, this book will have you swooning and wanting to dance a cotillion! I have had the privilege of reading three of the novellas (Unleashing Love by Jessica Patch, Second Impressions by Pepper Basham, That's when I Knew by Laurie Tomlinson) so far. They are fun and unique stories that will have you laughing out loud and falling in love with the characters. What I have appreciated is the variety of authors in this collection. I have gotten to read one of my favorite authors like Jessica Patch and gotten introduced to authors I have heard of like Pepper Basham and La I have had the privilege of reading three of the novellas (Unleashing Love by Jessica Patch, Second Impressions by Pepper Basham, That's when I Knew by Laurie Tomlinson) so far. They are fun and unique stories that will have you laughing out loud and falling in love with the characters. What I have appreciated is the variety of authors in this collection. I have gotten to read one of my favorite authors like Jessica Patch and gotten introduced to authors I have heard of like Pepper Basham and Laurie Tomlinson, but had never had the chance to read. I will definitely be checking out more by their books in the future. In the past, I have read reviews of other novella collections where readers have said the characters were not well-developed or the stories felt rushed. What I can assure you is that you won't have those same feelings about this collection. Review for Laurie Tomlinson's "That's When I Knew". Featuring childhood sweethearts thrown together in a mini road trip in order to save her career, what could possibly go wrong? I laughed my way through the heroines relatable mishaps, and cheered for her happily-ever after. Novellas can make it difficult to get a good grasp on the characters, but Tomlinson excelled at making hers unique and memorable, even in such a short time span! I loved her writing and can't wait to read her next novel. Laur Review for Laurie Tomlinson's "That's When I Knew". Novellas can make it difficult to get a good grasp on the characters, but Tomlinson excelled at making hers unique and memorable, even in such a short time span! I loved her writing and can't wait to read her next novel. Laurie is definitely a new author to follow! Loved this novella about romance, with a touch of Jane Austin. The beautiful setting and storyline were awesome. Christina portrays a beautiful picture of an unlikely romance between a tiny artist and a landscaper. I loved the setting, the storyline, and the characters. This was a laugh out loud romance that I really enjoyed. I'm sitting at a picnic table reading the book out loud to my sister in law about some the heroine's and hero's dates. We were laughing so hard and loud that people were turning their heads. This book will make you feel so good because of the laughter. Loved this sweet sassy romance,the storyline and sweet baby Cora Lee. A cute romance novella pairing a by the book nanny and a laid back drummer. I loved how the put God first in their lives. What a beautiful romance about second chances and being who you are, messes and all. I loved this hilarious, laugh out loud, refreshing novella. There is lots of love, faith and prayer sprinkled throughout. The best fall on the floor laughing part of the novella was Jordan's reaction to Elizabeth's pregnancy. "Pregnant How did that happen?" Jo Ann laughed as she took her sons cheeks in her hands" Well you see, daddy Brian over there planted his seed into___." I found this to be a delightful collection of novellas. This collection introduced me to quite a few new authors that I look forward to reading more from. My favorites were Second Impressions by Pepper Basham, Unleashing Love by Jessica Patch, and That's When I Knew by Laurie Tomlinson. The stories were all different, but I enjoyed each one. *I received a free copy of this collection in exchange for my opinion. Pepper's stories never cease to make me smile. Even in this sweet and short story, she is able to pull at my heartstrings and make me full out belly laugh. Filled with history, Austen, romance, humour, and matchmaking...You can read this in one sitting very easily. I will forewarn you, Second Impressions will have you constantly day-dreaming about England, Austen, and swoony heroes. I received a complimentary copy of Love at First Laugh for promotional purposes. I was not required to write a revi Pepper's stories never cease to make me smile. Even in this sweet and short story, she is able to pull at my heartstrings and make me full out belly laugh. This is a amazing box, I was given an advanced copy of it. Great read. This is my first book by Pepper, I will have to more since I really enjoyed the story of Nora and Ethan, it was very enjoyable. Another new author to me, a very funny start to the book, love the way they meet. I will have to see about more of her books. Love the story of Lea and Maverick, they are good friends and both are trying online dating but do they really belong together. I always love Heather books and this one is no exception. Restoring a home, will it turn into love. A very interesting story. I love books with babies and dogs, this has both. This is my first book by Jessica and will definitely have to check out her other books. Love her writing. Mari is the Nanny and Brandson the brother of her employer comes home and she doesn't know who he is. He ends up with a knot on his head. A very entertaining story, love the little girls in it. Chelsea and Nick knew each other years ago. They meet again, will they be able to find love. They live in two different places, will they be able to make it work. A very interesting story. Love, love this one in the set. Eight contemporary Christian romantic comedies that put a smile on your face. The set includes: Second Impressions by Pepper Basham, Mowed Over by Christina Coryell, An Informal Affair by Heather Gray, A Heart Restored by Elizabeth Maddrey, Unleashing Love by Jessica R. Patch, A (nearly) Normal Nanny by Krista Phillips, That's When I Knew by Laurie Tomlinson, and A Time to Laugh by Marion Ueckermann. My favorite in the set was Mowed Over by Christian Coryell with a tiny, chatty fairy artist and Eight contemporary Christian romantic comedies that put a smile on your face. The set includes: Second Impressions by Pepper Basham, Mowed Over by Christina Coryell, An Informal Affair by Heather Gray, A Heart Restored by Elizabeth Maddrey, Unleashing Love by Jessica R. Patch, A (nearly) Normal Nanny by Krista Phillips, That's When I Knew by Laurie Tomlinson, and A Time to Laugh by Marion Ueckermann. What a great novella collection so far! Im still working on finishing the series but wanted to share my thoughts so far..
Nora believes that she is going on a trip of a lifetime celebrating her favorite author. Ethan believes that he is going on a trip to wrap up some business. This book had me laughing from the moment Nora was waiting to check into the hotel. Basham's writing makes you snicker and laugh at the situations and outfits her characters are in. She What a great novella collection so far! Im still working on finishing the series but wanted to share my thoughts so far..
Nora believes that she is going on a trip of a lifetime celebrating her favorite author. Ethan believes that he is going on a trip to wrap up some business. This book had me laughing from the moment Nora was waiting to check into the hotel. Basham's writing makes you snicker and laugh at the situations and outfits her characters are in. She is great at describing the situations and bringing them vividly into your mind. The characters were so charming and delightful and it was fun to watch the relationship develop. Chelsea and Nick were so much fun to get to know! Tomlinson wrote the perfect female character for me. Shes a sports loving, independent women who's trying to do the right thing for everyone she cares about. She thinks not only of herself but those she cares about. Nick has never forgotten Chelsea and seeing her again throws up all the feelings he had for her. Tomlinson had me laughing with the unique situations that Chelsea finds herself in, and swooning when Nick takes her on the perfect date. I like how they didn't jump into things and took the time to make the big decisions facing them. They knew they would find happiness if they had faith in themselves and each other. I'm definitely looking forward to reading more from this author! I received a complimentary copy of Love at First Laugh and this is my honest review. I read my first novella in this collection, That's When I Knew, by author Laurie Tomlinson and I can't wait to read the rest!! In, That's When I Knew, we're introduced to planner extraordinaire, Chelsea Scott who's life is anything but planned especially when the boy who stole her heart and then broke her heart shows up again. I loved the sassy moments shared between the characters almost as much as I loved the sweet ones. The humor Laurie Tomlinson brings to the story is authentic and had me la I read my first novella in this collection, That's When I Knew, by author Laurie Tomlinson and I can't wait to read the rest!! In, That's When I Knew, we're introduced to planner extraordinaire, Chelsea Scott who's life is anything but planned especially when the boy who stole her heart and then broke her heart shows up again. I loved the sassy moments shared between the characters almost as much as I loved the sweet ones. The humor Laurie Tomlinson brings to the story is authentic and had me laughing out loud throughout. The plot line of the story is as refreshing as the characters and I'm looking forward to reading more of this author's work. I cannot offer reviews on the other novella's in this collection but if they're even half as good as this one I know I won't be disappointed. Love at First laugh is truly that! I loved each story from the first laugh from the beginning of the stories to the end. Loved the sweet romance and love throughout each book. Novellas aren't always my favorite because they tend to be less satisfying because they're shorter and tend not to be able to follow through on character development...but this collection has follow-through! The authors that joined forces on this collection are awesome on their own so when put together...how can it fail?! Love at First laugh is truly that! I loved each story from the first laugh from the beginning of the stories to the end. Loved the sweet romance and love throughout each book. Novellas aren't always my favorite because they tend to be less satisfying because they're shorter and tend not to be able to follow through on character development...but this collection has follow-through! The authors that joined forces on this collection are awesome on their own so when put together...how can it fail?! A guaranteed enjoyable read for anyone who loves to laugh and enjoy sweet Christian romance! Too hard to pick a favorite story! Loved them all! Each of these stories is filled with love, joy, and laughs. I can't pick a favorite, for each spoke to my heart in a different way. I know you will feel the same as you read this special collection. I enjoyed the books in this novella collection! My personal favorite was from Laurie Tomlinson. Her characters are vibrant and rich, with wounds and real-to-life relatable issues. Faith weaves in and out of her story and the hero even goes macho in one scene to defend the heroine's honor *be still my swooning heart* (Although I believe she was quite capable of defending her own, it's still a great swoon factor). All in all, the collection was well written. My personal favorite authors of the gro I enjoyed the books in this novella collection! My personal favorite was from Laurie Tomlinson. Her characters are vibrant and rich, with wounds and real-to-life relatable issues. Faith weaves in and out of her story and the hero even goes macho in one scene to defend the heroine's honor *be still my swooning heart* (Although I believe she was quite capable of defending her own, it's still a great swoon factor). All in all, the collection was well written. My personal favorite authors of the group were Krista Phillips and Laurie Tomlinson and Jessica Patch. Love these books! My favorite author, Christina Coryell, was one of the authors, so I knew I wanted to read these stories! Christina's book is awesome like always. I enjoyed the rest of the stories and it gave me an opportunity to find more authors that I will look into reading more of their books! I was familiar with some of the authors in this collection, but what an absolute laugh riot, and such a joy to discover the rest! I so much enjoyed reading these novellas! Each one was a quick read, and the set together kept me in stitches the entire time… Even my husband got to enjoy some particularly amusing quips! Definitely a fun one...don't miss it! Over all this collection is comical yet lovely. An easy read and the writing flows magnificent. The story's take you through the life of eight completely different couples. These couples face different circumstances but are all inspired by their personal beliefs and faith. The faith and Lord is what helped pull them together. They have extremely high morals. I absolutely loved it. This collection of romantic adventures begins with the story of Nora Simeon, whose family sends her to Bath, England for a Jane Austen Festival vacation. Arriving full of jet lag, she discovers that her room in the Elizabeth Elliott Inn has been double-booked, with none other than the new owner of the vintage establishment, Ethan Keller. And so it begins! A delightful set of novellas that I truly enjoyed. While reading these stories, there were times when I laughed out loud. The authors each have a unique way of telling a story. This is a good set to give as a gift, too. I loved the stories! They were sweet and funny. The stories are short and can be read in an evening. I read four of them and each were different and Unique. What a deal too!! Great price... great reads! *I was given a copy of this book and was under no obligation to leave a review.